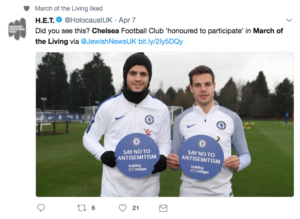 Israel marked it’s Holocaust Remembrance Day this week and Chelsea FC made a bold stand against anti-Semitism by sending some of its players to Poland to participate in the annual #MarchOfTheLiving . The popular London team, which is number 5 in the British Premier League is currently running a ‘Say No to anti-Semitism’ Campaign as part of a wider ‘Building Bridges’ initiative to promote equality and celebrate diversity. According to new reports, club directors, Bruce Buck and Eugene Tenenbaum; Under-18s manager Jody Morris; Olympic gold medalist Sir Steve Redgrave; and Chelsea Academy players all took part in the March from Auschwitz to Birkenau – places that are both synonymous with the Holocaust. They were accompanied by former Chelsea Manager, Avram Grant who is the son of a Holocaust survivor. It’s no secret that Chelsea’s owner, Roman Abramovich is Jewish as are other club officials, which may be the motivation behind the Say No to anti-Semitism campaign, but it goes much further than that. It seems some Premier League supporters have anti-Semitic tendencies and the club is determined to address these. They are to be commended for leading the way for other professional sportspersons and clubs to follow. The 2018 March of the Living took place on Thursday, April 12th led by the President of Israel, Reuven Rivlin and the President of Poland, Andrzej Duda. Some 12,000 marchers including the squad from Chelsea walked the three kilometres from the Auschwitz Museum with its notorious overhanging sign, ‘Arbeit Macht Frei’, to the site of Birkenau, the biggest of the Nazi extermination camps. At Birkenau, not far from the ruins of the gas chambers where over a million people were killed, they were addressed by the two Presidents. Holocaust Survivors and the founders of the March For the Living also spoke. There was outstanding musical performances and even a choir from Japan. The march is held annually and is attended by young people from around the world including many from Israel. This year marks the 30th year of the march and a mother who attended the first event in 1988 spoke about her need to revisit the journey of her family members that perished in the Holocaust and her daughter shared about attending for the first time. “You are building a wall against Holocaust denial. You are the stones in the wall. The bridge to the generations to come,” said Avraham Hirschson co-founder of the March of the Living speaking to marchers from all over the world. Fellow co-founder, Dr Shmuel Rosenman promised the Holocaust Survivors that their stories would always be remembered and passed on to the next generation. This seems like a negative way to end off, but there is hope. When professional footballers care enough to travel hundreds of miles to join in a March of the Living, to be living witnesses to what happened some 70 years ago, then perhaps we can tackle this problem together. Hopefully we can kick anti-Semitism out of our world once and for all. Only those who have been to Auschwitz can truly know the shock of coming to terms with the colossal scale of the entire operation. It touches you deeply and I am sure those young men from Chelsea will return to England with a whole new outlook on life and what really matters.